Gruul Spellbreaker ($0.99) Price History from major stores - Ravnica Allegiance - MTGPrice.com Values for Ebay, Amazon and hobby stores! Card Text: Riot (This creature enters the battlefield with your choice of a +1/+1 counter or haste.) 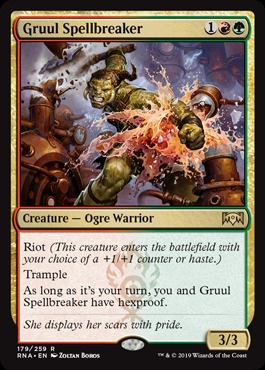 Trample As long as it's your turn, you and Gruul Spellbreaker have hexproof. Flavor Text: She displays her scars with pride.